Kids’ Day is an opportunity for ICMAB members to show their children their workplace, and gives them the chance to be a ‘little scientist’ for a day. ICMAB and its employees invite their daughters, sons, and relatives, between the ages of 1 and 16 to attend. The girls and boys will be participating in interactive learning activities, which will inspire them, introduce them to Materials Science research, and make them understand their parent's working lives. At the same time, ICMAB employees will serve as role models for the girls and boys, and will surely learn from this experience, especially the ones without children, who will appreciate the pressures of parenthood! The Kids' Day is organized by ICMAB enthusiastic volunteers. We would like to thank in advance all the people participating in the organization of the event! 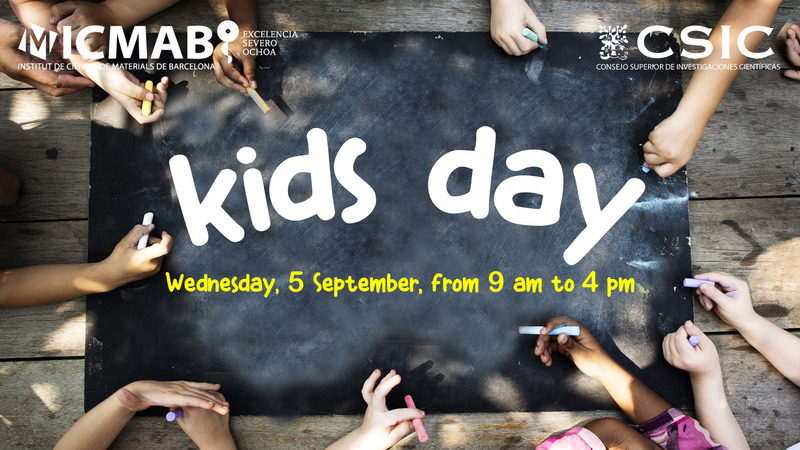 The "Kids' Day at ICMAB" is inspired by the "Take Our Daughters and Sons to Work Day", pioneer in the US, Canada and Australia, and now becoming popular also in Europe. We are sure that it will be a success! Last year, the Kids' Day was a great success, and most of the children would like to repeat the experience! Great success of the KIDS' DAY at ICMAB. Training the scientists of the future!